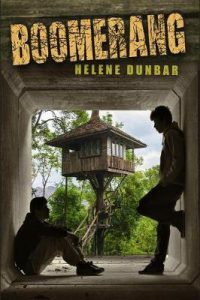 Boomerang by Helene Dunbar was one of those beautifully written books that sort of creeps up on you. I can’t even stop thinking about it! It was actually also quite stressful, because there’s lots of complicated relationships going on here and you can’t help but panic a little hoping it all works out. It’s about messy kids and messy feelings and the heartfelt angst of brokenness. Definitely a book I’d recommend in a heartbeat! The story is about Sean Woodhouse who’s returning home after 5 years of being “kidnapped”. Except he wasn’t kidnapped…he ran away from a neglectful mum and found an old loving couple who took him in and kept him safe. He fell in love with the boy nextdoor and he liked his new life. But something happens and Sean realises he has to go home. He’s #1 goal is to see if he can get use of his college fund and then leave again, but things get messy as his mother has changed and is a good person now and his whole town treats him like this poor rescued child. He’s torn between staying and going. Staying may be the “right” thing to do, but there will be brutally heartbreaking consequences if he doesn’t go. The tension is the top thing I’ll rave about for this one! It had me so hooked I couldn’t do anything but keep reading. You just desperately want to know if Sean will stay or go, and as things escalate with the boy he left behind, Trip, who has a terrible life and needs Sean to come back…you just don’t know what the right choice will be. I also liked that it was this “missing child” story, but with a twist. Admittedly I have read this twist before, but not for a while! And it was done SO well. And it was bittersweet knowing how much Sean needed to be loved, and that’s why he ran, but all the while his true family and childhood friends thought he’d been murdered. Imagine living with that?! I also adored the love interest, Trip Marchette. He’s the boy next door and Sean’s childhood crush, but it’s complicated. It’s messy and their feelings for each other are unnamed and sometimes their relationship is downright poisonous. Trip’s abused by his uncle, but won’t leave. And Sean gets caught up in his own self-righteousness of not understanding the situation. I got hair-tearingly frustrated at BOTH of them. But madly wanted it to work out. There is a little love triangle, which I found a huge drawback, except that it was really well written! Sean, back at home now, meets Emery who is absolutely lovely and dynamic and complex. It was hard to be mad at her for stealing Sean’s attention, when she was a fantastic person! It added another layer of tension to the story too, wondering if their relationship would unfold or if Sean wouldn’t lose focus of what he came home to do. I also appreciated the diversity! There’s no labels, but most of the characters would probably identify as queer, plus Trip has dyslexia and it was portrayed so well. Boomerang is seriously the kind of book you can’t put down! It’s complex and really unpacks thoughts about consequences and actions, what love means, and the difference between selflessness and selfishness. The pacing will keep you glued to the page and the characters will make and break your heart.